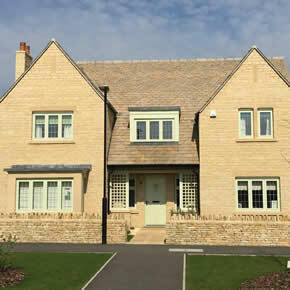 Aggregate Industries has supplied a range of reconstructed stone walling and roofing products to Elements at Cerney on the Water, a Redrow development in Gloucestershire’s South Cerney. Comprising over 120 four and five bedroom properties, the development is located on the northern edge of Bradleys Lake in the Cotswold Water Park – the former site of an Aggregate manufacturing plant. The properties have been designed and arranged to complement the landscape; the houses form an arc-shape around the water’s edge, providing open views across the lake. Aggregate Industries was contracted to supply a number of its reconstructed stone products for use in the development. It provided a comprehensive package, consisting of its Masterblock concrete blocks, which were used for the structural build, and its Bradstone walling and conservation roofing. The roof tiles were supplied in a variety of lengths and widths to create an authentic, natural appearance. They were able to meet the strict planning requirements, which demanded respect for the conservation area. As an artistic alternative to natural stone, Rough Dressed walling was specified for the exterior walls in Buff. Aggregate was able to deliver the volumes required by Elements at Cerney on the Water; as the company is based in close proximity to the development, the team could guarantee a quick turnaround. The short delivery distance also helped to improve the sustainability credentials of the build programme.